It is estimated that over a third of all crops grown on this planet are now diverted into animal feed to sustain the meat industry. Here in the UK we are a net importer of animal feed, mainly in the form of soya and maize, and around 85% of that feed now consists of genetically modified (GM) crops. So, how can you tell if your meat comes from an animal that has been fed on GM feed? Well, if you buy your meat from Asda, Morrisons, Tesco, Sainsburys or the Co-op then, unless it specifically states on the label of the meat you buy that it is organic and grass fed, you should assume it has been fed on GM foodstuffs. These supermarkets have all recently relaxed their restrictions on GM-fed meat and dairy products. However, just because the government refuses to act does not mean that we can’t change things at an individual level. Supermarkets have always been susceptible to pressure from shoppers, as demonstrated through successful campaigns over free range eggs and sustainable fish. The simplest and ultimately most effective way to convey the message that we do not want GM-fed meat and dairy products is simply to resolve not to buy them. Let’s move on to a GM-free recipe. I have always grown parsnips on my allotment plot, the Circus Garden, but for me they are quite a frustrating vegetable because the size of the yield varies dramatically from year to year for reasons I cannot fathom. I have always planted the same variety – Tender and True – and roughly the same quantity of seed each year, but whilst in some years I am overwhelmed with a glut of parsnips, in others I am left harvesting just a handful. But whether in lean or bountiful years, the parsnip is a vegetable which benefits from being left in the ground during the winter as the frost helps convert its starch into sugar, making for a sweeter taste. I’ve used it in this recipe to create a lovely, light and crispy gnocchi. 1. Preheat the oven to 190°C (375°F, gas mark 5). Wash the parsnips. Dry them then rub them all over with the olive oil. Wrap them in cooking foil, place them in a shallow roasting dish and put in the pre-heated oven for 35-50 minutes, depending on the size of the parsnips, until they are very tender and easily pierced with a thin knife or skewer. 2. When the parsnips are cooked, remove them from the oven and leave to cool until it is possible to handle them. Carefully peel the skin from the cooked parsnips and place them into a food processor. Blend until smooth, then scrape the resulting puree into a mixing bowl. 3. Add the ricotta, egg, Parmesan, chives, salt and 75 g (half) the flour. Gently mix to combine all of the ingredients. The dough will be quite sticky, but avoid the temptation to add more flour as it will affect the texture and density of the gnocchi. 4. Dust a large board or clean work surface with some of the remaining flour. Divide the gnocchi dough into four. Take one of these pieces and gently roll it into a long sausage shape about 1-2 cm in diameter, dusting extra flour on the board or work surface as necessary to prevent the dough sticking. Cut this sausage into pieces approximately 2 cm in length. 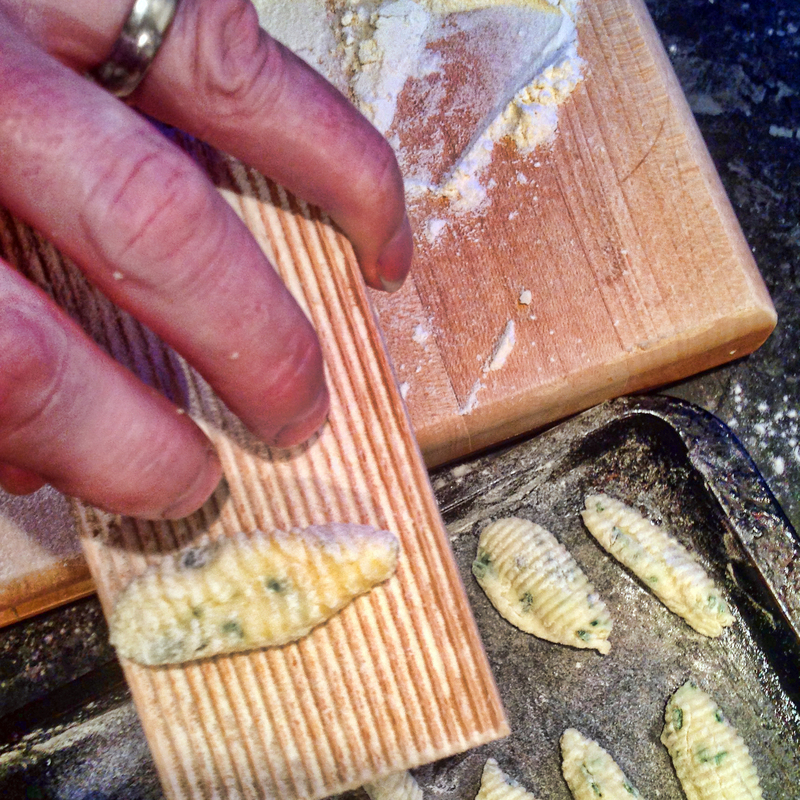 Gently roll each piece over a gnocchi ridger, or under the tines of a fork, to create a lined indentation. Carefully place these ridged gnocchi pieces onto a lightly floured baking sheet. Follow the same procedure with of the rest of the gnocchi dough. 5. Bring a large pan of salted water to the boil, then reduce the heat to a simmer. Carefully tip half of the gnocchi into the pan of water and give the water a gentle swirl. The gnocchi will quite soon rise to the surface. At this point cook them for a further ten seconds only, then remove the gnocchi with a slotted spoon and place briefly onto kitchen paper to drain, then tip gently onto a clean baking tray or plate. 6. Place the butter in a pan over a high heat. It will melt and then begin to sizzle. At this point add the gnocchi and toss it in the hot butter for 3-4 minutes until the gnocchi start to colour and crisp. Now add the sage leaves and give the pan a further shake or two to coat the leaves with the foaming butter. After 20 seconds (that’s all the sage needs), remove the gnocchi from the heat. Add the lemon juice to the pan and quickly stir it in. Distribute the gnocchi between plates or bowls, with a drizzle of the sage butter and lemon sauce. Serve immediately. Of coarse you can just buy your meat from a top class butcher who can tell you directly where it comes from. I use The Ginger Pig. OK it costs a small fortune, but it tastes amazing and the ethics are impeccable. I love veggie food too. your recipes are divine mwah mwah but there is no need to insult those of us who are happy to eat meat but do discriminate about where it comes from. Hi Anna. Thanks very much for your kind comments about my recipes. There was no intention on my part to insult meat eaters in this post, on the contrary my aim was to highlight the sneaky way the supermarkets have recently lowered their meat-buying standards. I believe we would all benefit taking the trouble, as you clearly do, to source and buy good quality organic local produce, including meat, and one of the aims of this blog is to encourage others to do the same. Between animal feed and biofuels, it’s a wonder there’s anything left to eat. Although, did you see the New York Times article about farmers in the corn belt who are planting (small) areas of their farms with fruit and veg to cash in on the interest in locally grown, fresh foods – as you say, pressure from shoppers can do wondrous things. I was interested to read about the gnocchi ridger too – never knew that such a thing existed! Hi Sarah. I hadn’t seen the NYT article, but that’s a really positive story. I picked up my gnocchi ridger by pure chance just a couple of weeks ago (and I hadn’t heard of such a thing before either), and in fact it was that discovery that was the inspiration for this recipe!